This has gone immediately on my wishlists. It seems to be slated for publication on 1 August. Some of his books include an appendices of sermons. It will be great to have them in one volume. Get copies as gifts for your priests and for seminarians. Oh yes, there is a preface by Pope Francis. This entry was posted in Benedict XVI, The Campus Telephone Pole and tagged Benedict XVI, priesthood, Priests. Bookmark the permalink. What is happening with the Ignatius Press project of the Collected Works of Joseph Ratzinger? I have Volume 11, but there is silence about any further volumes. Can we expect any more? Is the preface the equivalent of “photo bombing”? Please, I’m having trouble completing an Amazon order for this as they need your address, and I’m not seeing how to order around that… I’ve ordered before somehow, but am flummoxed as to how! I guess I am never happy when Pope Francis must be included in any book about Pope Benedict. They are no longer publishing those volumes of his collected works. The one published will be the only one. I contacted Ignatius Press some time ago. Arwene…. I am saying a little prayer to St Peter that you will have the grace of seeing our popes as our popes without distinction between persons. Allowing one’s self to diminish the respect all popes deserve only leads to very bad places. I wonder why Ignatius Press is no longer going to publish the volumes of Benedict’s work, that is disappointing. 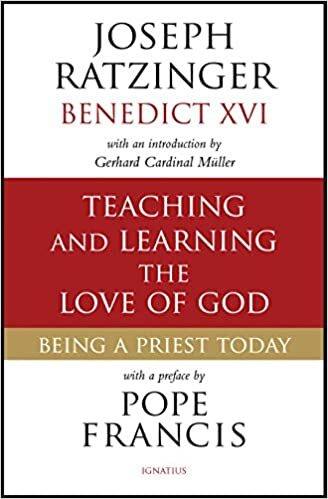 Pope Benedict on Call to Holiness: On Love, Vocation, and Formation,”the most relevant addresses, speeches, and homilies of His Holiness, Pope Emeritus Benedict XVI to seminarians and consecrated men and women into a single volume for the English-speaking world”. I wonder is this the same book as the one to be published by Ignatius Press? Any footnotes in the preface? Did you go to his wish list to order?